Beautiful Outdoor Kitchen Ideas | Associated Construction Products, Inc.
Get inspiration and news delivered to your inbox. 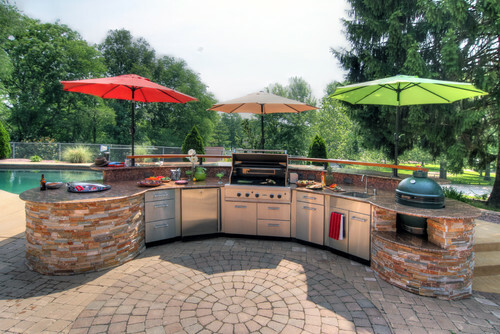 An outdoor kitchen is an impressive house feature that brings function to your outdoor living space. Browsing the internet for inspiration can leave you feeling like outdoor kitchens are only possible for million dollar houses, but we know that’s just not true. 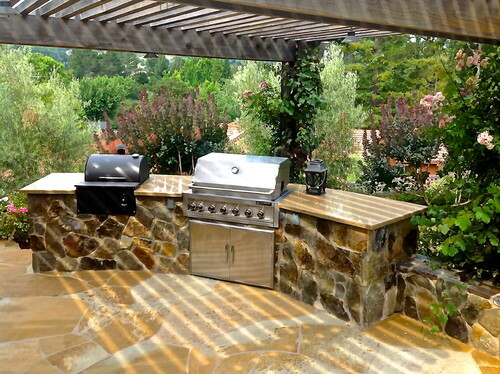 Your outdoor kitchen can be modified to fit within your budget. Start with this inspiration for beautiful spaces to gather with friends and family. 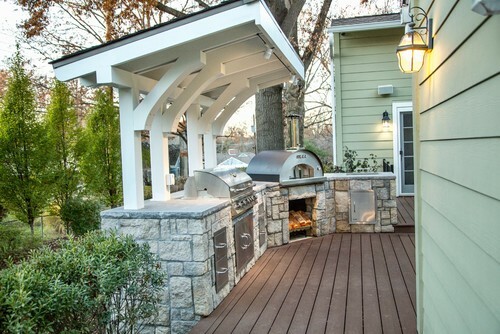 Your backyard makeover contractor will help you work your big outdoor kitchen ideas into your realistic budget. Photo by The Home Improvements Group, Inc.
A small area can be equipped with an outdoor kitchen area without restructuring what you already have. 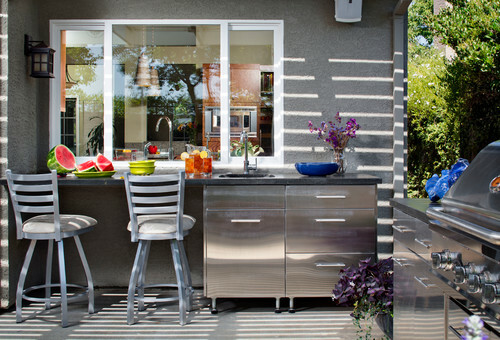 Bring modern life into your outdoor living space with cool appliances, shades of gray, and stainless steel. If you already have an outdoor living area you like to spend time in, add counter space and appliances to turn it into a full-fledged kitchen area. A grill, mini fridge, and sink are all you need to turn it into a full-fledged cooking area. Just make sure you start with the foundation of beautiful pavers! Materials are an investment up front, but choosing quality stone and pavers gives you a space you won’t have to spend money on in the future. Invest in quality items now, and it will not only last for years and remain a timeless outdoor feature. 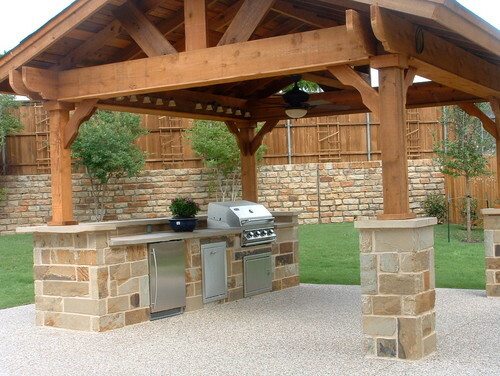 You don’t need a full structure for a beautiful outdoor kitchen. Remodel your deck space with beautiful pavers, countertops, and stainless steel appliances. A poolside outdoor kitchen gives you all the more reason to take a dip in the water before and after you grill. Photo by Alder Group, Pool and Landscape Co. If you’re big on entertaining, you can’t beat a tap right in your outdoor kitchen. Guests (and family) will love having cold beer on tap while relaxing outside. The only challenge is deciding what you’ll keep on tap in your outdoor living space. Photo by Garden Lights Landscape and Pool Development Inc. 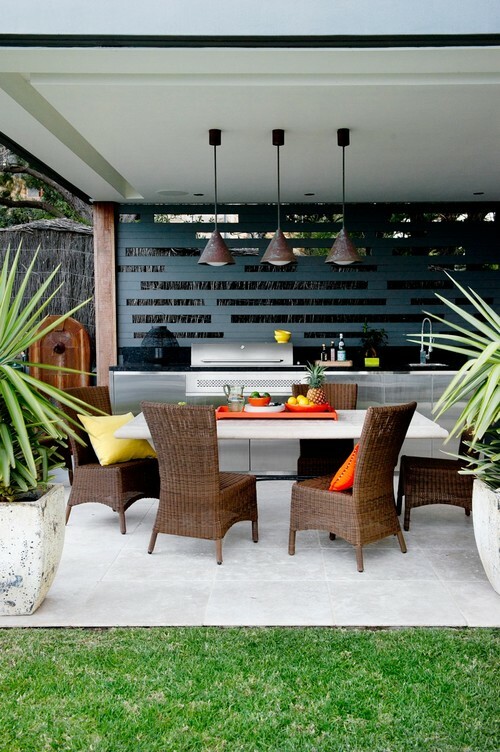 Surround your outdoor kitchen with a with lush garden space to enhance the cooking experience. Add a pergola for shade and style. The result is an enchanting outdoor space with function and elegance. 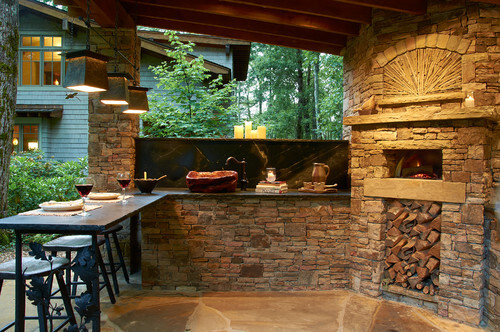 Stone adds interest to an outdoor kitchen built on a deck, with a pizza oven and grill. Add a dining table, grill up some ribs, and your deck goes double duty as a kitchen and hang out area. Ask your contractor if your deck can be surrounded with a functional wall with built-in appliances. Just add seating and you have yourself an outdoor kitchen! A sturdy roof of pergola keeps you cooking through hot days or rainy evenings. Did you find something that inspired you within the pictures above? 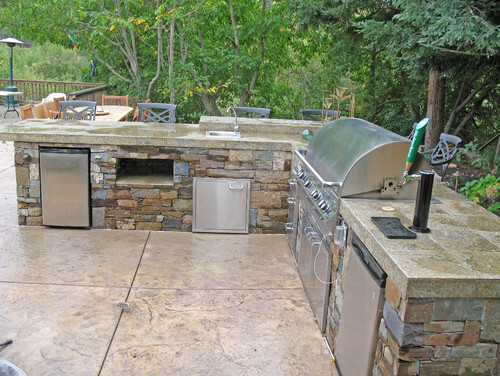 Every outdoor kitchen begins as an idea. Give us a call and we’ll make your inspiration your reality. Should I Screen in my Outdoor Kitchen?